Join Lolo, a round blue hero who sets out on a quest to save Lala. A princess kidnapped by an evil King. It’s up to Lolo to travel to the Kings castle and make his way through fifty rooms in over half a dozen floors, and save his love. Adventures of Lolo is a puzzle game that often feels like an action title. 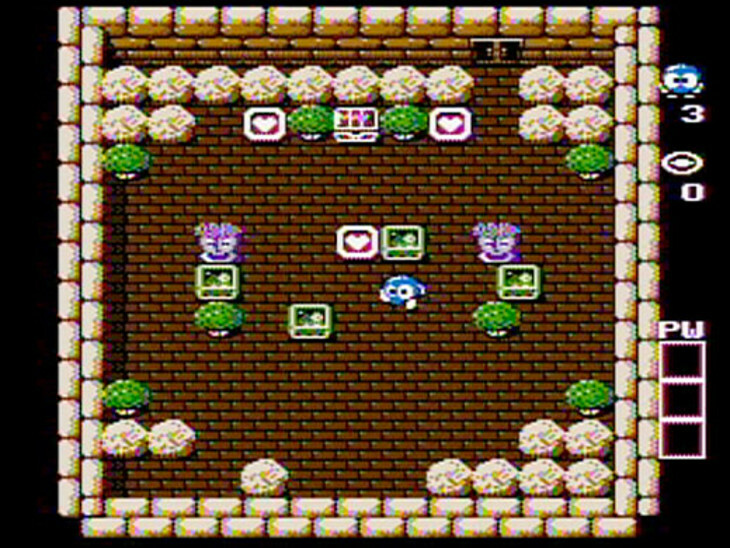 Lolo has to make his way across each room within a floor, gathering up half a dozen hearts. Once these hearts have been gathered, the chest in the room opens up and reveals a gem. The gem is key to opening the exit to the room and allows Lolo to make his way forward. Sadly, for Lolo, once all the hearts have been gathered up and the chest opens, enemies who are dormant also come to life and start chasing him. If they get to you before you get to the chest, its bye bye Lolo. 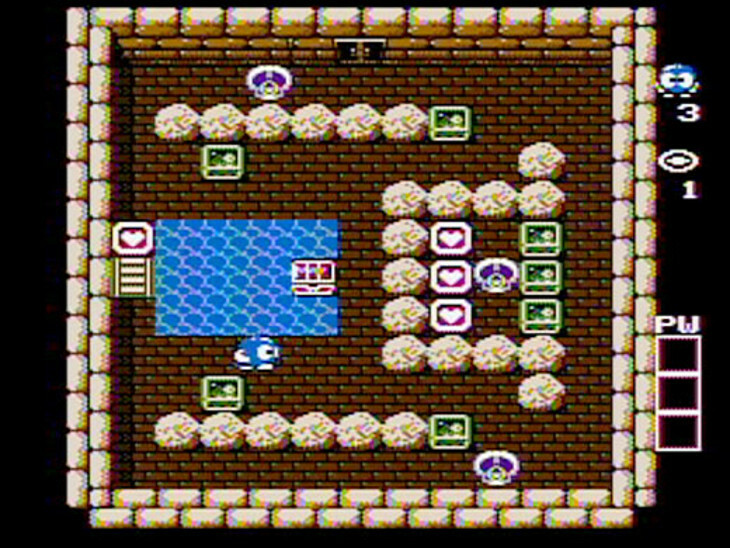 Lolo has to not only fend off enemies in tricky and thought-provoking ways but also fight certain types of enemies off with an egg-like bubble shot, which temporarily traps the enemy. 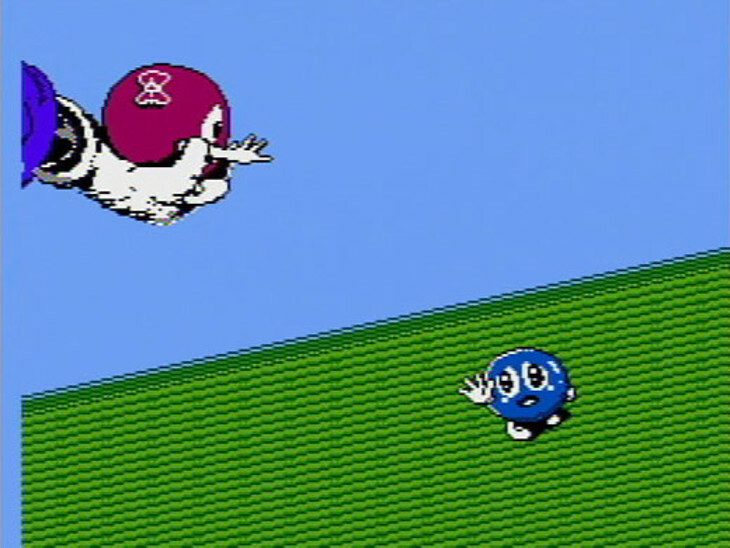 However, only certain enemies are affected by this bubble shot. Some enemies include, medusa type statues that scare Lolo, freezing him on the spot whilst they blast him to smithereens. Others, include fire breathing dragons. Armadillo’s that chase you across the room, skulls that come to life once the hearts have been gathered and chase you across the room like the armadillo. Worms that remain on the spot and are used more for bubbling up and pushing across the screen to use as a bridge or a shield against the medusa statues. And lastly, a gremlin enemy that chases you across the screen, but once they touch Lolo they freeze in place and fall asleep, blocking Lolo’s path back to any space he may need to make his way to. At first, it’ll be a test and try method for the player. Each enemy has different attack patterns. With some being able to kill Lolo, and others acting as a tool. The player will need to learn when to trap an enemy and when to encase them into the bubble and utilize it as a shield or bridge. 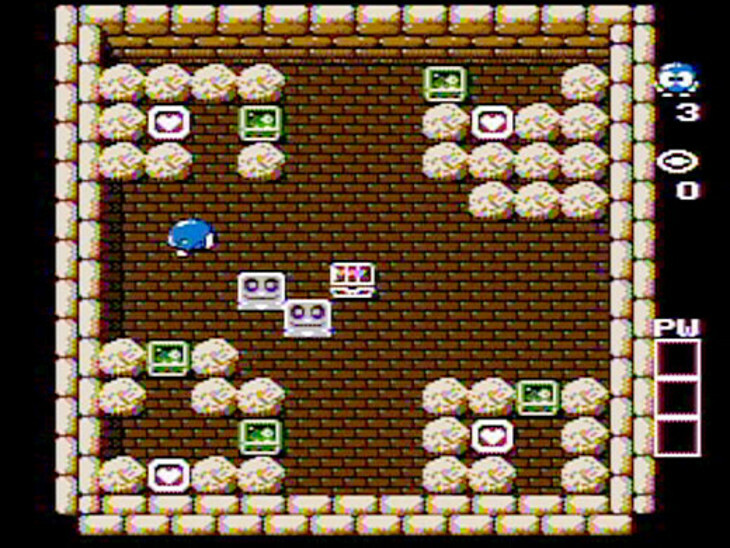 An example, trapping skull enemies in between movable blocks so that they’re unable to catch Lolo whilst he tries to gather the gem in the chest. Another example is, using the same movable blocks to block off fire balls from immovable enemies who let off blasts as you cross their path. These are the fire breathing dragons or medusa-like statues. 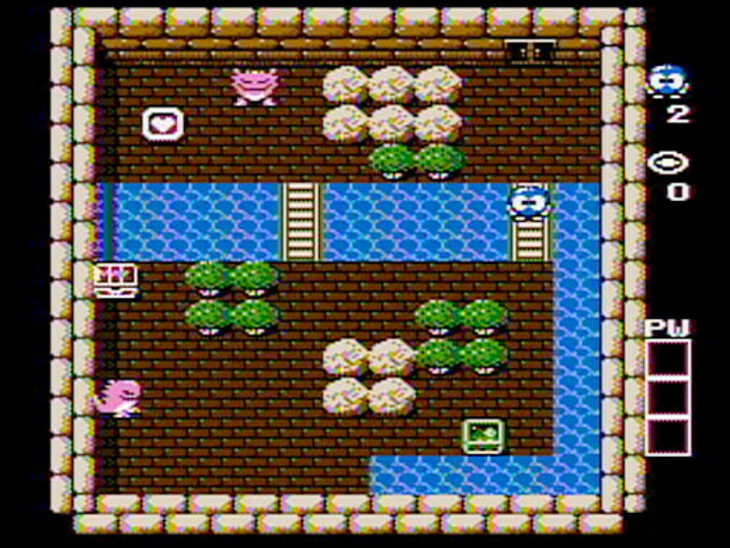 Although the game seems to use the same colour palette in every single room and level. And the soundtrack is quite literally the same thing throughout the game, the level design is quite smart. The puzzles in each stage are challenging to the point of me pulling out my hair a few times. And at other times making silly mistakes. Like forgetting to place three separate blocks in place while passing enemies that fire off projectiles from across the room, making me start the stage from the beginning, over and over again. Then there is a level that I kept dying at because I just could not figure out how to out run an enemy, only realizing after what seemed like a hundred deaths that I should actually encase the enemy inside the egg-like bubble and trap it in between two boulders by pushing the bubble in the center and moving a block in front of the space to keep it trapped. Then there were the bridges players are tasked with creating. In some levels, the heart that needs to be collected is on a platform surrounded by a body of water. A moat of sorts. In the early stages, once the player collects one or two hearts, you are given a bridge to place across the adjacent platforms. Later in the game, you’ll need to use your resources such as the bubble thingy and worm enemies to create a raft or bridge platform to get across the water. Quite creative actually. All in all, Adventures of Lolo was an incredibly fun title to play from a puzzle perspective. Creating intuitive and creative challenges for players to put their minds at work. Sadly, it falls short in the aesthetics department by retaining the same colour palette throughout the game as well as the same soundtrack through what is fifty stages. Making it seem as if you’re just moving through one level constantly. 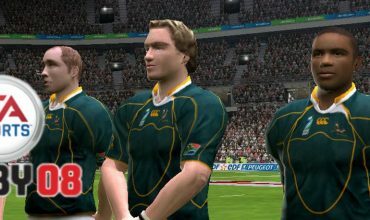 Although the puzzles are creative and entertaining, the music and look of the game forces the player to play the game in stages. Or it did in my case. I found myself putting it down and coming back to it a few times. 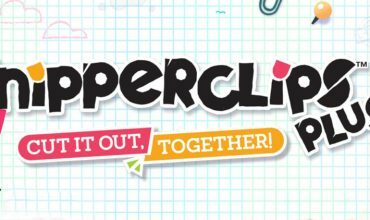 If puzzle titles are your thing, then this is definitely one to try out, and with it being on the Switch, it grants the player the comfort of picking up and putting down at your own convenience. In respect of story, music and aesthetics, don’t hold your breath on this. Join Lolo in an adventure to save Princess Lala from an evil King. 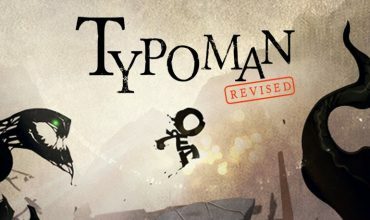 An adventure filled with thought provoking and creative puzzles, and enemies that'll stop Lolo at every corner.